Butternut squash, also known in Australia as Butternut Pumpkin is a winter squash available in early fall through winter. It originates in Mexico when it is believed that the natives there where eating butternut squash as early as 5500 BC. 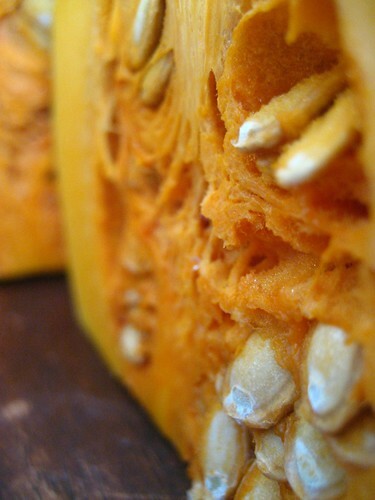 Butternut squash has a vase like shape with a hard, thick yellow to a light tan skin and is filled with seeds. It grows on a vine; the flesh is orange, to deep orange when ripe, with a sweet flavor and a nutty flavor similar to sweet potato or pumpkin. - How to store it: With their thick skin, butternut squash can be kept longer than summer squashes. Store in a cool dry place (between 53F- 64F/ 12C- 18C) for up to two months. If the squash has been cut, wrap it with a plastic wrap and put it in the crisper for up to three days. Butternut squash freezes very well: peel it, cut it in pieces and freeze it. - How to cook it: Once peeled, discard the seeds and cut it in pieces. Then it’s up to you, butternut squash can be boiled, roasted, baked, steamed and stir-fried. It can be used in soups, gratins, lasagna, raviolis, and pasta in general, as a ratatouille, or even in sweet tarts, flans and jams. - Nutritional values: Butternut squash is known to be a good antioxidant low in calories, before you add the generous dollop of butter to it, and diuretic and laxative. - Good with spices: Cinnamon, anise seeds, cardamom, ginger, mace, clove, nutmeg, paprika, turmeric, cumin, ras-el-hanout, and allspice. - Good with herbs: sage, savory, tarragon and thyme. Now that I am done with my Friday Basics, I would like to pass on some awards. I am not teaching you anything by saying this, but let me just say it: blogging is so much more than writing posts, taking pictures and having feedbacks. It’s way more than that. It is the experience you share with your readers, who then become your friends. As I started this blog about seven months ago, I never thought I would be so addicted to it and how many people from all over the world would cross my path. We share this same passion for cooking with its good and even failed adventures and we open up about our personal backgrounds without feeling ashamed of what we do, of what we say or how we might be judged. It just feels like home. So from the bottom of my heart, to all of you who have always been a regular, to those who have left some sweet notes and to those who have only took a glimpse at what I do, I say Thank You. Now lets go back to the awards. The lovely Nora of Life's Smorgasbord, who is just a sweet and brilliant person, awarded me with the Thoughtful Blogger Award. - Haalo is just one of my favorites. Sweet, kind and shares all what she knows to help others. - Marion. This woman is talented, generous, caring and very smart. - Anh is a genuinely sweet woman. She always has the kind word that makes you smile. - Shayne, my friend, takes kindness to a whole new level. This woman won’t hesitate to call you to tell you how much she loved your post. - Ivonne, what can I say about her. She is Ivonne, the Godmother of thoughtfulness, generosity and passion. I wish I could give more awards to all of you but they ask just for five. Another thing before I go, you will notice for th next week or so that I won’t be blogging as much as usual. We are in the process of moving to another house, which we are very excited about and my days are filled with boxes, boxes and more boxes. I will post about the Daring Bakers Challenge and will be back in a few days hopefully, after I get my things more organized. Until then, have a wonderful weekend my friends, eat well and be happy. I'm deeply moved with this award, and really praised of what you feel about my blog. I love your squash picture, and the Friday Basics have been great. Love the idea of a Thoughtful Blogger award! Rose First I want to say that Butternut squash is my favorite and I jsut bought one today. Thank you for the award I am touched that I am one of your five. Congratulations on moving into your new place. As you know I am so excited that you are moving closer. Rose, your squash photo is fantastic! It is that time of year where we see lots of orange! as a reader, merci pour le remerciement, and as a food lover, I love butternut squash too! and I think you picked great bloggers to carry the torch. Hope your move is easy and uneventful! - My dear friends, thanks a lot for sweet words and to all who have won the thoughtful award, you really deserve it. The move is going smoothly but it is very tiring, I will tell you more about it very soon hopefully. Thanks for all this info about the squash. We get it all year round in Sydney. Actually, there are few things that we don't get all year round, that's why I think people get confused which season were are in, as if it's not already confusing enough that we have opposite seasons to the northern hemisphere. Thanks for calling me "brilliant" (*blush*). And all the best for the move. I hate packing & unpacking & cleaning... It's especially hard with a young child in tow. My favourite way to use butternut squash is roasted and pureed in a soup, so good!